Joseph and Ann Calcraft's family, c.1899. Report of Joseph Calcraft's unsuccessful appeal to the Tribunal regarding Albert Calcraft's call-up. Grantham Journal 7th May 1916. Albert Calcraft joined up in 1915 after his father had appealed unsuccessfully for him to be exempted on the grounds that he was needed to help keep the family’s three farms in order. He was one of eight sons, one of two that joined the forces during WW1. Albert Calcraft was the eighth of the ten children of Joseph and Ann Elizabeth Calcraft. Joseph Calcraft was a farmer, born in 1856, baptised on the 6th July at Muston, son of William Mary Calcraft. He married Ann Elizabeth Parnham in 1877 at Bingham, Nottinghamshire. She was born in 1855 and baptised on the 13th May at Whatton, near Bingham, daughter of Thomas and Mary Parnham. Joseph Calcraft died in 1918 in the Grantham district, aged 62, and was buried on the 31st May at Muston. Ann Elizabeth Calcraft died in 1948, aged 93, and was buried on the 3rd March at Muston. In the family photograph taken in 1899 or 1900, Albert is the boy on the left of the three children in the front row (follow this link for a more detailed explanation of this picture). In 1891, Joseph and Ann Elizabeth lived at Village Lodge, Village St, Muston. There were six children: Joseph P (born in 1879), assisting on the farm; Thomas W. (b.1880), assisting on the farm; John H. (b.1882), Florence (b.1884), Mary Ellen (b.1886) and Arthur (b.1889). In 1901, the address was given as Woolsthorpe Rd, Muston. Joseph Jnr and Thomas had left home, but there eight children in the house: John H, Florence, Mary E., Arthur, Frank (b.1891), Albert (b.1894), George F. (b.1895) and Edward (b.1898). In 1911, the address was merely ‘Muston’. Here farmer Joseph Calcraft, now 55, and Ann Elizabeth, also 55, were accompanied by George Frederick, their ninth child, who was working on the farm. In 1911, Albert Calcraft lived at Wood Nook farm, Little Ponton, near Grantham. The household comprised his sister Mary Ellen (25, farmer’s daughter dairy work), Frank (19, farmer’s son), Albert (17, farmer’s son) and Edward (13, farmer’s son). In 1916, the Grantham Journal reported on the Kesteven Tribunal held on the 2nd May at which Joseph Calcraft applied for exemption for Albert, aged 22, but his appeal was disallowed. Joseph was 60, and feeling the strain of coping with the family’s three farms at Wood Nook, Little Ponton, Breeder Hill, Sedgebrook and Sykes Lane, Muston. He died only two years later. Nevertheless, Albert had to go. He had already attested, at Grantham on the 10th December 1915, but presumably had only now received his call-up papers against which Joseph was appealing. 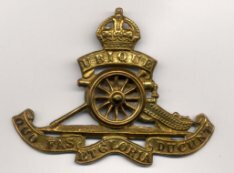 Albert joined the Royal Field Artillery, as a skilled horseman. He became Gunner 205325 B Battery, 291 Brigade, RFA. He served in France, but became ill. In October 1917, he was treated in England for “paralysis of the soft palate following diphtheria”, then again for a month early in 1918 at Ripon, again for diphtheria. He was finally sent to the dispersal centre at Harrowby in January 1919 and discharged soon afterwards. According to the Long Long Trail website, 291 (CCXCI) Brigade was set up as a 2nd Line Territorial Unit attached to the 58th Division. This Division fought in France from February 1917, and in the autumn of 1917 was part of the Battle of Passchendaele, so it was probably here that Albert Calcraft became ill, his condition recurring a short time later in 1918. In May 1918 he returned to B Battery. On the 8th June his records state that he was wounded but remained on duty, and was granted per diem war pay, then in September he was sent home for 14 days leave. In 1919, Albert Calcraft married Constance Mary Hart, at Melton Mowbray. He returned to the family farms, and in 1939 he and Constance were at Calcraft’s Farm, Muston (Sykes Lane farm) with daughter Edna (b.1920) and son Arthur L. (b.1923). Albert Calcraft died in 1966 and was buried at Muston on the 12th September, aged 73. Constance died in 1983, in the Rushcliffe area of Nottingham, aged 88. Thomas William Calcraft also fought in WW1. He was the second of Joseph and Ann Elizabeth’s family, born in 1880 in Muston. In 1901 he emigrated to British Columbia, then and on the 27thJune was recorded living at Indian Head, Qu’Apelle, Saskatchawen, a “single, hired man”. After returning to visit England he returned to Saskatchawen. He attested in or near Saskatoon on the 23rd December 1914, and in 1916 is known to have been at Shornecliffe Camp in Kent, though his home was at Kindersley, Saskatchawen. No details of his war service are available at the moment. However, it was in March 1917 that he married 26 year old Nellie Sarah Bailey at Lewisham, Kent. In June 1921 he was back at Kindersley, having survived the war. He died in 1934, aged 54, in Saskatchewan. Florence Calcraft, b.1884, got married in 1907 in Grantham, to George William Tinkler. Sadly, she died only four years later in 1913 in Grantham, aged 29. Mary Ellen Calcraft, b.1886, married Bertie Rippin in Grantham in 1917. She died in 1923, aged only 37, in Grantham. Her husband, born in 1886 in Long Bennington, died in 1971 in Grantham, aged 85. Thomas’s elder brother Joseph Parnham Calcraft married Emma Hammond on the 19th June 1900 at Boothby Pagnall, Lincs. In 1903, they emigrated to Canada and lived at Indian Head, where he died in 1956, aged 78. John Henry, b.1878, the next in line, married Mary Parnham in 1905 in Grantham. In 1911 they lived in North Witham, Lincs, then in 1913 they emigrated to Canada to live at Indian Head. However, by 1939 they were back in England living at Breeder Hill. John died in 1967 at Grantham, aged 85. Arthur Calcraft, b.1889, emigrated in 1908, again to Saskatchewan. He lived at a variety of places including Balgonie, Indian Head, Belvoir, Richardson and Kindersley, between 1911 and 1920. However, after visiting England in 1921 and returning to Canada, he sailed to Southampton in 1922 and appears to have remained in England after that. In 1923 he married Elsie May Raithby in Grantham. He died on the 10th May 1961 in Grantham, aged 72. Frank Calcraft, b.1892, left for Canada in 1912 and lived at Kindersley, Saskatchewan, until the summer of 1921, when he returned accompanying his brother Arthur. He married Mabel Hallam in 1924 at Grantham, and in 1939 they were living at Barkestone-le-Vale. Frank Calcraft died in 1977 at Exeter, aged 85. George Frederick Calcraft stayed in England throughout and appears not to have taken part in the fighting, being needed to run the farms. He married Ellen Phillips at Grantham in 1918, but died relatively young in 1925, aged 30, and was buried at Muston on the 19th March. Edward, the youngest of the family, b.1897, worked at Wood Nook and Breeder Hill farm. In the 1920s he was at Breeder Hill, along with his widowed mother, Ann Elizabeth, where they were joined by John Henry and Mary Calcraft around 1930. In 1939, Edward and Ann Elizabeth were accompanied by Nellie (Thomas William’s wife) and 13 year old Elizabeth Calcraft. There is no record that Edward married. He died in Grantham in 1996, aged 99.